Today we’re talking to Peter Allen who runs Mastodon Valley Farm in Wisconsin. of animal agriculture as a method of managing landscape for ecological health. A bit of a spoiler; not ALL animal agriculture is bad for the environment. Learn More about Mastodon Valley Farm Here. episode every other week instead of every week. Thank you for listening to this weeks episode. See you next time. Levi: From my understanding, Mastodon Valley Farm is a 220-acre farm in Southwest Wisconsin. So can you give us an overview of all the things that are happening at your farm? Peter: Sure. So we’ve been here– this will be our fourth season here. Of the 220 acres, it’s about half open so pasture and the half is kind of steep wooded hillside. We’re in the drift less area of Southwestern Wisconsin so when the glaciers came down through the ice ages for the last 3 million years, they somehow missed us. They went all around us. All the areas to the east and west, south and north were all glaciated. But this little corner was never glaciated so we have our original topography. Kind of steep hills and valleys (big and broad valleys). We have trout streams. We’ve got one flowing through our property. That’s kind of the basic ecology here (we’re zone 4). So we’ve got a little bit of everything. We’ve got a stream running through the valley. We’ve got steep, sandy hill sides. We’ve got clay soil ridge, fields and woods in various levels of disrepair and then pastures that have been conventionally grazed. Then we have crop land that has been conventionally cropped that we’re in the process of taking out and putting back into grassland. We managed with animals, primarily cattle, sheep, pigs, goats and some poultry. Levi: Awesome. So you didn’t mention mastodons in your list of animal species that you’re raising so how did they come to the picture? Peter: Mastodons were sort of the largest grazing animal here for about 17 million years up until the end of the ages about 10,000 years ago so they were here for a very, very long time and they shaped the landscape here, maintaining an open Savannah-type landscape as opposed to a closed forest landscape which because we don’t have any large herbivores, if you take a piece of land and let it go, it turns into a closed forest. That is an anomaly over the past 30 million in North America. There were large animals that would not allow forests to close up like that so we are in the process of clearing out our woodlands, opening up Savannah habitat which is sort of out Native ecosystem here. So the mastodon is sort of our mascot in those activities, managing in ways that they would have. It would clearly be easier to have a herd of mastodons come through than for me to spend hour after hour with a chainsaw but we do what we can. Peter: That’s a serious amount of meat right there. I’m looking at one of our bulls right now out the window and he is actually getting upset because there’s a bull in our neighbors pasture. He probably weighs 220 pounds or so. He’s a big guy. That’s probably an exaggeration. He’s probably more like 1900, maybe 2000 but he’s got a ton of meat but think about 20,000 pound bull mastodon. It’s a whole different story. Levi: That’s crazy to think about but very cool. How is it ecologically beneficial to have more of these open areas versus just forests? Peter: There’s a number of reasons. One is strictly biodiversity perspective. Closed forests tend to– there’s only a few trace species that can reproduce under a hundred percent shade conditions. So most species (plants) need sunlight to grow. Maples and basswoods are one of the few species that can actually live for a long time without hardly any light. And then if a tree falls, it’ll get a little shot of light and then jump up into the canopy. That’s kind of classic forest dynamics but those are fairly low diversity systems and they don’t really support much animal life. There’s some birds that live there. Earth worms in the soil and the whole [00:08:11] chain. There’s rodents, somewhat, but there’s not much food produced in those systems like oak trees which produce most of the food for wildlife and woodlands can’t reproduce under shady conditions. You don’t really have oak trees in a closed canopy forest, at least not one that’s been closed canopy for more than 50 or 100 years. So they really can’t feed animals and then therefore they can’t really feed humans. It’s not an ecosystem that can support large human populations. They’re great to have in the landscape. There’s nothing wrong in having forests, clearly but as an ecosystem that can feed people they’re very limited. Ecologically, the carbon is all held above ground in the trees, which as trees grow they sequester carbon in their biomass but as they die, a lot of that goes back up into the atmosphere. So they’re more of a steady state once they’re a full forest in terms of their carbon dynamics. Whereas a grazed savannah, that carbon is getting put into the animals and is getting put into the soil. With savannahs, we can actually build soil and sequester carbon in the soil which forests can’t really do because they don’t build soil in the same way that grasslands do. Forests have pretty thin layers of organic matter on top from the tree fall and from the leaves falling but they’re not sequestering a whole bunch of carbon because that carbon’s gonna go up into the trees. Then the other aspect is water. Closed canopy forests, the ground is bare. There’s no plants growing on the ground. There’s no ground cover in a closed canopy forest. So most of the water that falls in terms of rain gets soaked up buy the trees but not very much goes back into– they’re not as good as getting water into the ground and recharging our aquafers. Grasslands are really good at that. The more carbon we store in our grasslands, the more water they can hold, but also they allow that water to percolate back into the system. There’s lots of benefits for savannahs. There’s lots of benefits for forests, clearly, but (I’m not anti-forest) I think forest in the right places and the right times and right circumstances not– I mean, around here, basically anywhere that’s not managed turns into forests. Our steep hillsides are just all forests and it’s probably the first time in millions of years that that’s actually been the case because there would have always been animals here that would have eaten giant ground sloths walking around eating whole trees and interrupting that succession. We obviously don’t have a lot of those animals that are disposal in terms of managing our ecosystems. There’s lots of issues in terms of private land and fencing and all that kind of stuff to maintain or restore large herbivore habitats. So we got to use what we can get which right now, our biggest herbivore that we can manage right now are cattle. We hope to diversify more, too. We’re gonna try to get some [00:11:27] this year and maybe a few other grazers but we work with what we can manage. Levi: Awesome. That piece about soil carbon, I think is really important now especially with what’s going on with climate change and from my understanding, this could be one of the key strategies for re-absorbing or sequestering all that excess carbon dioxide in our atmosphere into the soil. I was wondering, have you done any measurements or soil tests to see– I know you have only been there for a couple years now but to see any kind of movement there in the soil carbon. Peter: When we first got on, we got initial soil tests done and I don’t expect there’s any changes as of yet. Part of that is that I’m a hundred percent grazing the way I want to in the future just because of infrastructure constraints and resource constraints. We need to invest 50-100,000 dollars in fencing to get us to the place where I really manage all the animals like I want them to. That should happen here within the next few years but for now, they’re not grazing as tight as I would like. I’m moving them every two to three days because that’s the fencing that I’ve got instead of once or twice a day. I don’t expect that we made dramatic changes on our organic matter just for a couple of years but I think we’ll be able to test again here in a few years and I expect it will have gone up for sure (soil organic matter). Levi: Sure, sure. And are there some other example farms that you’re aware of that have been doing this for longer that have shown the results? Peter: There’s classic examples like gay brown. I think Greg Judy [00:13:20] has done a little bit of monitoring. The process for measuring soil organic matter is not straightforward– Well, it’s fairly straight forward but it’s not something that a farmer can do. You got to ship it to a lab. Everybody does it a little bit differently so the monitoring of soil carbon is a major challenge in terms of being able to have consistent results over long enough time frames that you can actually compare apples with apples. There is work being done by the soil carbon coalition, Peter Donovan, and those guys, Gabe Collins [00:14:01] and that’s all really good. We need a lot more of that but right now, for the average land owner, that’s not a very feasible thing to do. Hopefully, that will start changing. Levi: Gotcha. Something that comes across quite clearly is your educational background. It seems you have quite a bit of knowledge about ecosystems and how they work. How did that come into the picture? It sounds like you started more in education around ecology and complex systems theory and that sort of led you to doing what you are doing now. I’m wondering about the thought process that took you from the one to where you are now. Peter: I guess my time in the university was spent in ecology but my main motivation was sort of ecosystem restoration and rehabilitation. It’s sort of witnessing the vast, global destructions of ecosystems and realizing looking forward the future of humanity is pretty bleak if we can’t regenerate these ecosystems because we sort of need them for survival and we’re losing them very, very rapidly. We don’t feel those effects quite yet partially because fossil fuels are so cheap we are able to replace or substitute services that we normally achieve from functional ecosystems with stuff that we make from fossil fuels. Looking forward, that may not last forever so it’s sort of realizing how dire the situation was and how important ecosystem restoration is for the future. The way I went down that path was through university and doing research and sort of realizing that conventional ecosystem restoration strategies employed by private companies and university trials and experiments, I felt that they kind of missed the point. They weren’t really concerned as much about a functioning ecosystem as in trying to replicate a configuration of plant species that they think was probably there in the past based on bits and pieces of evidence here and there. While those practices I don’t think are bad, I think it’s great to try to restore native species to place, I think the focus on species– then you get into the whole native versus exotic or invasive battle or war and basically restoration ecology (at least in the Midwest) has sort of become a war between trying to establish native plants and eliminate exotic plants which there are good and bad aspects to that but if you take a step back from my perspective– I was interested in an ecosystem that functions, an ecosystem that supports biodiversity, that cleans water, that provides clean air and provides resources for people that does all these things that builds soil. We’ve lost so much soil over the last 100 years and 10,000 years, especially in the last 100 years that if we don’t start having ecosystems that build soil fast, we’re going to be in real trouble. So I was way more concerned with ecosystem functionality than arbitrary species configurations. So I went down the university path trying to develop those thought and was somewhat successful but I sort of realized that based on studying– I was really interested in researching the Native American use of land and how they were managing because they maintain these savannahs for thousands of years. Modern ‘restorationists’ can’t even restore savannahs because they require active human use and the paradigm in the university in modern conservation thinking is that we need to preserve landscapes which means we need to eliminate humans. These super functional ecosystems actually require humans in there since we eradicated the mega fauna or at least they’re all gone now. However, they disappeared now. They’re gone. Because they’re gone, if we want functional ecosystems we are they keystone species that has to get in there and do things. If we let ecosystems go they actually slip into a dysfunctional state. So realizing all that and realizing that if we want to do this at scale, if we want to restore functional ecosystems across the planet, it’s gonna have to be done in a way– I suppose there are examples like the greening, the desert. There’s a few examples like in China where there has been a top down approach like a governmental approach to ecosystem restoration. I’m not totally against that but I feel like the most viable solution is if we can figure out how to make it a profitable private enterprise that individuals can make a living from by doing this restoration. Then there’s a chance that it could happen in a more widespread scale. I looked around and didn’t find a whole lot of it. There’s people like Mark Shepherd planting a lot of trees and there’s people like Gabe Brown [00:19:42], there’s people like Greg Judy [00:19:44], there’s grazers but I didn’t see a lot of examples of people doing a full integrated system in a profitable way. That kind of became our mission to develop a landscape, kind of a broad acre landscape restoring appropriate tree species and having appropriate animal impact in a way that was profitable. Levi: Great. So did you have prior experience with agriculture or farming? Levi: So then how was it in the beginning? Have you done enough studying that it came smooth– I guess for me, it was a really tough transition five or so years ago when I coming without experience into it. So was there a learning curve for you or did you have neighbors or people around that were helping you out? around and try to convince them to walk on a trailer and go to the slaughter houses. It’s a whole other issue. There’s been a lot of trial and error and mistakes all over the place but we just keep learning and I think the key to doing something like this where you don’t have experience (I don’t have a multi-generation farm. I don’t come from a farming background. I don’t have a support network of experienced farmers) I think the key from our perspective is being honest about how much we don’t know and being willing to ask when we need it but also being willing to say, ‘I messed up. That was a total bad thing to do and next time I’m going to do it differently.’ And then also just watching carefully what’s going on and I think my background in ecology not just intellectually or abstractly but because I was so into the ecological science (I spent a lot of time outside making observations, looking at systems, interacting with systems) being on land now with animals I really make lots of observations about what’s going on in the grass. How the plants are responding to animal pressure, how are the cows interacting with young trees, what are they eating, what are they not eating, what are the sheep doing, and what are the goats doing? I think that the ability to just sit quietly and observe, I think, is a really important piece of being able to successfully start with very little knowledge and be successful. Levi: I wonder how many farmers or land managers now they don’t have that as an important piece of their strategy. Instead, are just listening to different authorities or documentation about what they should do on their land. Levi: Leveraged n by debt, you mean? Peter: Correct. Leveraged by debt. So they don’t have a lot of room to just sit around and make observations and then change their management based on those observations. They don’t have the buffer, the free board to be able to do that. I definitely don’t blame them for managing the way they do. It’s a brutally difficult enterprise and so just the fact that they’re still there is impressive. But I think observation for a new person starting out especially somebody of the regenerative permaculture mindset, I think observation and learning how to observe, learning how to put yourself in the mind frame of another species. Try to think like a cow. Try to think like an oak tree. Try to think like the grass. What’s important to you? How do you sense the world around you? It really helps to understand all these various interactions and how we, as managers, can make decisions that benefit all of the actors involved. Levi: Definitely. It seems like another piece that would make it harder to change or innovate is once you scaled up to such a degree, it’s a lot harder to change. But if you’re keeping it more small scale and diversified like you are doing and a lot of the smaller farmers are doing, it’s a little bit easier to change and adapt. Levi: You mentioned the financial viability of the thing. Would you say that your farm is financial viable? Is it a hobby farm that’s kind of breaking even or are you guys able to pull in a little bit of income and pay some bills with it? Peter: We’re profitable. We make money. We are able to make a profit on all out enterprises. We’re starting from scratch so we’re still in the very early building phase. We need to build a barn. We need to build handling facilities for all the different species. We need to build lots of fence. We’ve got to invest in the farm radically so we are able to make enough money to keep ourselves alive and going a modest income just to pay our bills and then the rest gets plowed back into the farm. It’ll probably be another 10 years or so before we develop our infrastructure to the point where then all of our profits can be more available for us as our family. But for now most of it kind of goes back into the farm. Levi: That makes sense. But that is great to hear though that you’re able to keep yourselves going. I think a lot of farms struggle with that. What are some of the main pieces of the financial picture? I’m imagining the cattle is a big piece. Peter: Our real only income is selling meat. It’s a mix of beef, pork and lamb. We sell on a CSA bundle so the cattle or everything contributes to that. We really don’t raise any animals that we don’t sell for meat. That’s the income stream. Levi: About how many animals do you have of each species? Peter: I just took in two bulls. But right now we’re running about 50 head of cattle and that includes– we’re sort of birth to finish so we’ve got moms, we’ve got their last year’s calves, we’ve got their yearling calves from the year before. We’ve got out herd bull and we also buy in some calves from neighbors because we don’t have enough breeding stock here to provide all the beef that we need. So we do buy-ins yearling steers every year. So right now a total of about 50 head of cattle. Sheep, we have in the past. Pigs. The way we do pigs is we don’t have infrastructure for breeding so we just feeders every year, about 25-30 head would run in the summers. We had been doing that with lambs. Just buying in lambs and finishing them up here about 25-30 a year as well but now we’re starting to do breeding of that. So we got right now 20-25 or so ewes and a ram. Levi: One second. I’m just going through my notes a little bit. I do have one kind of side question or slightly side question. There is something that I’ve noticed in a lot of environmental literature that is very critical of animal agriculture because it’s a major contributor to climate change and habitat loss partly because of the methane that they produce and also, with animal agriculture you can produce less food per acre because the animals themselves need so much land to grow as compared to plant crops or something. While those arguments might apply to industrial scale like conventional forms of animal agriculture, do those critiques apply to your methods? How would you respond? Peter: They don’t. Honestly, they don’t apply very many places especially the whole animals take up more land. If land can have crops grown on it, it does. That’s just rule across the world now. Nobody grazes animals on land that could have crops planted on it so out of our 220 acres here when we bought it, there was about 30 acres of land that could have crops on it and it did. The land that couldn’t have crops on it because it was too steep had animals on it. So nobody raises animals on crop land. They raise them out west on areas that are too dry or too steep to have crops on it and then they bring them into feed lots where they feed them the grain from that land. That’s just not an issue anywhere. Levi: I guess there is also what you’re saying the feed lots where there are certain number of acres where they’re raising grains, for example. Peter: Right. If the animals are not eating those crops and it’s living on marginal steep land that can’t be cultivated for human crops then it’s not at all interrupting any food coming to humans. A grass-fed almost by definition is not on land that can be cropped. There’s a few exceptions to that and people are doing it but for the most part, cropped land cropped and cattle are raised on more marginal environments that can’t be cropped like our farm. It’s all sort of steep hills and kind of marginal pasture so in our situation, we’ve got marginal pasture that can’t be cropped and they’re 100 percent grass-fed so they don’t eat any grains that could otherwise be eaten by people. There’s really no problem there. Peter: If you’re doing it right. The conventional environmental perspective that animals are bad is not unfounded. Conventional animal culture is environmentally destructive. Set stock grazing is not the best way to have grass, although I would say that even set stock grazing is a better land to use than many conventional tillage practices. Levi: Sorry. The set stock grazing that means that basically you have a big pasture and the animals aren’t moved around. They’re just kept in the same place. Peter: Right. It’s just one pasture and the animals just live there for the season. You don’t get the carbon sequestration benefits, you don’t get the soil-building benefits. You don’t get the biodiversity benefits that come along with a more rapid rotational grazing. But at least you’re not plowing. You’re not oxidizing all the soil organic matter by flipping the soil over. Then there’s various levels within the conventional grazing system of just leaving cows on a plot. There are people who do it better than others. Some people are overstock and some people don’t. Some people move their animals a little bit like leave them in one pasture for one or two months and then move them which is still conventional grazing but doesn’t have the benefits of rotational grazing but it’s still a little bit better than totally denuding the pasture with cattle. But anyway, our ecosystems all evolve with lots animals eating the plant. So all of our plants evolved with animals eating them for millions and millions and millions of years. The only problem is when humans came along and built fences and kept a single species of animals in a single place for a long time. That is destructive. That’s not a good thing for the ecosystem. The conventional environmentalist problem with livestock isn’t entirely unfounded. But if we can change our management practices to more mimic the migration patterns or moving them around, then we might now get a hundred percent of the benefit that we would have with mega fauna but we can do a heck of a lot better than we’re doing now. Our mission is to figure out the best ways to manage on our particular piece of land whatever animals we can economically produce in ways that benefit our plants and our ecosystem the best. Levi: Got it. So it’s like one of those situations where animals are a powerful tool and they can be used destructively or constructively. Peter: Right. If I just fenced off our woods and put a hundred goats in there, it wouldn’t be very good. They would cause a ton of erosion. In fact, pigs in our woods it would be horribly destructive. We would lose tons and tons and tons of soil that wash away if I were to put pigs in our woods. It will just be a disaster. So there’s lots of ways to screw up with animals. There are few ways to actually do good. That’s what we’re trying to figure out. I’m curious with your pigs. Do you move them around, too? Do you never put them in the woods? We put them in areas that are wooded that have oaks and hickory trees only when there’s an abundance of mast or nuts on the ground. Otherwise, we keep them out of the woods completely because our woods are steep and pigs dig. We don’t ring our pig’s noses like some people do so we allow our pigs to dig. We have to have them on flat ground and be very careful about– We move them once a week or so, depending on how big of a paddock we make for them. But we got to be real careful with those guys. Pigs noses are shaped literally like moldboard plow and they literally turn the soil so they are incredibly destructive and you can management that destruction in a positive way but pigs are by far the most destructive and therefore the most difficult to manage regeneratively because they do cause so much disruption. There are cases where that destruction can be beneficial. We’ve got a ridge field that is in pretty bad shape. It was over cropped for a long time and when sown in a fescue grass species that it doesn’t do much. It grows fine in the spring and then it turns woody and the cattle won’t eat and it just sits there in a dead state, not photosynthesizing for the majority of the year. We don’t have water up there right now so we can’t bring our pig up there but as soon as we get water up there we’ll be moving our pigs there. The nice thing about pigs because they till, you can then re-seed with something that might be more beneficial for farm operation or more beneficial to ecology. So we’ll be re-seeding both native prairie and more conventional clover stuff up in those pastures to get more diversity and more forage in those areas. There are also like Joel South [00:38:18] and other people put pigs in the woods but usually those woods aren’t on 30 degrees slopes where all that soil is going to wash off the next time it rains. They’re more on flat land forests or woods. In our context, pigs in the woods doesn’t make sense because we lose– there are already in the woods very thin soils as they are and we would even lost those. You just got to be careful with an animal like a pig. Levi: Have you heard of spotted knapweed plant? Levi: That’s what we have all over our pasture. That and sheep soil [00:38:59] but it’s just a lot of spotted nap weed. That’s not super productive plant, it’s not something that we could feel cattle on so we’ve successfully been using our pigs and rotating them about once a week like you are and seeding behind it. It is really having a positive effect. They’re digging up the nap weed and displacing and then we’re able to get into those beneficial species. After hitting it a few times than the nap weeds are almost gone. Peter: That’s right. That’s exactly the situation where a heavy disturbance machine like a pig can be very handy and beneficial. Levi: Great. What would be your advice to folks who are out there and who are interested in getting into what you’re doing? Raising animals or having a farm that is restoring and benefitting the local ecology, as well as financially viable. Peter: Get experience. Go somewhere. Intern somewhere or something. I guess it just depends on individual situations. Everybody’s situation is a little different. We’ll have a different pathway towards land access and agricultural enterprises. One thing is I think it takes a very– running a farm like this is very chaotic and very difficult and very intellectually and emotionally draining. I actually like that. My unique personality thrives in that environment and I couldn’t imagine a more fulfilling occupation than what I’m doing right now but it’s definitely not for everybody. We’ve had people come out who think they want to be farmers. They spend some time here and kind of see the reality of the situation, what it’s like on the ground and it’s like, ‘yeah, you know what. My job sounds really good right about now. I got paycheck.’ I’m like, ‘go back to that.’ That’s great. Not everybody’s cut out for it so I think a little bit of a handle on the reality of what it is you think you want to do because there’s a lot of stuff online but there’s not a lot of reality online. A lot of stuff that is online is very (especially in the permaculture world) romantic, beautiful and it all sounds great. We’re like restoring the planet and feeding ourselves and it’s all wonderful. While that may be true, there’s the flip side of that which is the difficulty and the challenges of all that especially if you’re trying to make a living off the land. The only reason we’re able to stay here and live in fairly primitive conditions is because my wife and I are willing to sacrifice most of the personal comforts that most people would not be willing to sacrifice. In our personal situation and context, that was a decision that we had to make in order to have this lifestyle now. Other people in another context may not have to make decisions like that, make not have to make those kinds of sacrifices. I would imagine that a lot of people in younger generations, people like me or younger unless they’re independently wealthy will have some of those sacrifices. It’s something that takes a while to get used to if you’re coming from a modern, urban, comfortable life. It’s probably not a good thing to just go jump and live in an off grid tent somewhere but maybe ease your way into it because it is a shock to the system in a lot of ways. It’s a beautiful a thing and I think it’s something that most humans should go through but it’s not easy and there’s a lot of temptation to give up and go back to a situation where you can just turn on a faucet and hot water comes out. Levi: Son on that note, are there some opportunities coming up either on your farm or that you’re involved in where folks can get their hands on and get some experience or some knowledge? Peter: We accept interns in the farm season so that’s always kind of an open thing that we are willing to talk to people and explore a possible partnerships in situations that are mutually beneficial. Every year we host an 8 day permaculture design course. We do the basic permaculture stuff, a lot of it in pre-course webinars to get it out of the way and then we’re on the farm. For 8 days we’re focused pretty exclusively on the design and management of these broad acre regenerative agricultural system. 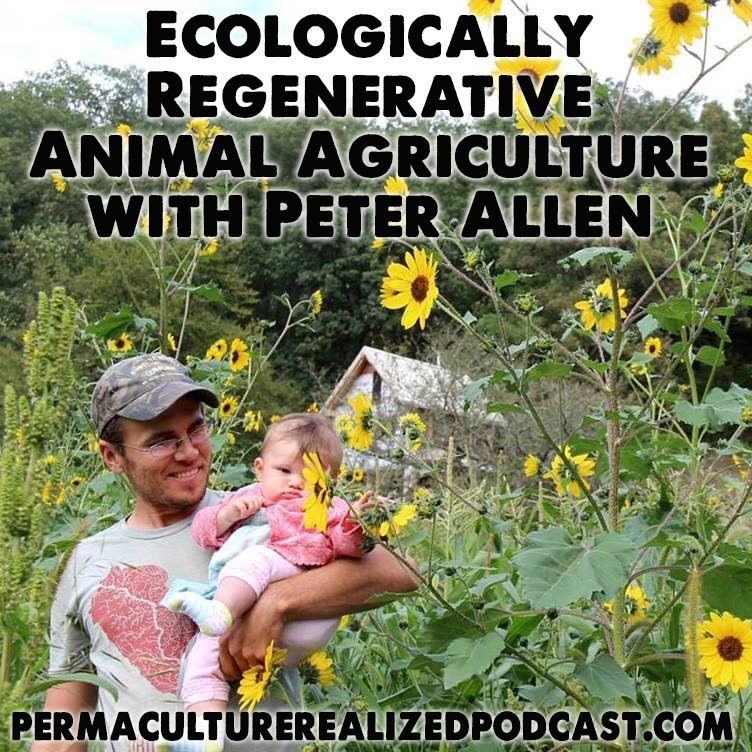 As far as I know, it’s one of the only permaculture design course that’s focused exclusively on regenerative agriculture (at least in the United States) so we always have a good group of people. We have a great group of instructors including Grant Schultz [00:44:15] and Lindsay Rabin [00:44:16], myself, Eliza Greenman [00:44:18] and my wife. We always have a great time and it’s always a great group of people. That’s coming up in June right around the solstice. We’re actually gonna have a big solstice bonfire here. Our friend, Dan Solberg [00:44:31], who is an intern for 3 years with Joel [00:44:34] at [00:44:35]. He’s back in Wisconsin. He’s got his own catering business. He’s gonna come out and do a whole hog roast, big bonfire party halfway through the week and then we’ll be working hard the rest of the week so we’re really looking forward to that. Levi: Awesome. That sounds fun. Great. Are there any last thoughts or messages that you want to share? Peter: I guess for folks who want to learn more about what we’re up to you can go to our website mastodonvalleyfarm.com. You can also follow us on Facebook or twitter. We pot a lot of pictures from the farm, keep people posted about what’s new here. A big project this year. We’ll be building a timber frame house so right now I’m out cutting and doing some logging and starting the milling process and we’re gonna do it all from scratch from trees here so that’s gonna be a really fun project. We’ll be keeping people updated on that. Levi: Nice. Well, that’s awesome. Thank you so much, Peter, for sharing your story and most importantly, doing all the work that you’re doing. It’s really inspiring and very cool.